We only have 2 slots left for anyone wanting to pitch their idea to our panel of tech titans! Hope to see you all come out this Friday to the Pitch at Stamford Innovation Center. At the Built In CT Pitch, aspiring entrepreneurs have the unique opportunity to jump start their technology business with a chance to win a full weekend of software development from a team of experts. They are provided a 5 minute slot to pitch their idea to our panel of angels, investors and entrepreneurs. The panel will first-most provide you valuable feedback, and then pick a winner from the group of presenters for the evening. Kathleen received her bachelor’s degree from Duke University and her J.D. from Brooklyn Law School. She resides in Wilton, Connecticut with her husband, two children and two dogs. Bill Gordon received his PhD from UC Berkeley while working with a Nobel Laureate James Watson at Cold Spring Harbor Labs, but then pivoted to earn a Wharton MBA. After Wharton, Bill worked on the buy side of asset management business, first for Dimensional Fund Advisors and then Alliance Bernstein, before pivoting again to found, manage and later sell his interest in what eventually became Cable Partners Europe, a broadband business in 4 major countries of Europe. That adventure led to yet another pivot when Bill helped friends launch Tetragenetics, a biotech company where he won a Gates Grand Challenge Exploration Grant for the company's work on a novel approach to create a malaria vaccine. Most recently Bill founded Lean Launch Ventures to run a startup accelerator in partnership with CT Innovations. He continues to be an active angel investor and adviser to a number of startups. As managing partner of Stamford Innovation Center, Barry brings over 25 years of experience in private equity to the Stamford Innovation Center with expertise in distance education, communications & media, retailing, consumer products, business services, and manufacturing. Additionally, Barry is the founder of Stoneybrook Capital, former MD at Commonwealth Capital and co-founder of Chemical Venture Partners. Able to leap tall tales and faster than a speeding viral market, Jackie Lightfield has used her super hero skills in the fight against mediocrity. As an entrepreneur since 1996, Jackie Lightfield has been a driving force in creating startups in digital space. She founded Norwalk 2.0 to branch into civic activism following stints as Chairman of the City of Norwalk’s Zoning Commission and Arts Commission. She designs and produces interactive location based travel stories at Pocket Tour Guide, another startup that produces authoritative guides to cultural attractions in the world's most fascinating cities. Mr. Allen has worked in all areas of technology over his varied career. More at home in an entrepreneurial environment, Chuck has established, managed and sold his own companies as well as worked with others on theirs. His most notable accomplishments have been as the General Manager of Microsoft's Middle East subsidiary; As COO of a 30-man startup in the financial services technology which Citigroup bought; And as CTO of Citi's Global Equity Finance where he managed teams in New York, London and Tokyo. More recently, as the non-resident COO of DriveDev, Inc., he managed the technology operations team at Activision's Call-Of-Duty web property for the preparation and launch of "Black Ops II". Mr. Ackerly has been President and CEO of Defentect and its subsidiaries, Splinternet Communications and Defencall, since January, 2000. Defentect is a developer of emergency response software, radiation detection hardware and communications services. After more than a decade producing third party peripherals for Apple’s computers, Mr. Ackerly turned primarily to software. Since 1995, Mr.Ackerly has provided technology consulting and design services to AMR Corp, The Sabre Group, AT&T and others. He currently serves on the boards of Spectrum DNA, S.A.R.L ATL Communications and CronusTechnologies, Inc. He served on the Board of Atari, Inc from 2001 to 2007. Mr. Ackerly earned an A.B. in Physics from Williams College and an M.B.A. from Harvard Graduate School of Business Administration. We are the biggest and baddest monthly gathering of technologists, investors and entrepreneurs in Westchester and Fairfield County. On the last Monday of every month, we bring an element of the original NYTM to Stamford, CT when several technology companies take to the stage and have 5 minutes to show us what they do. 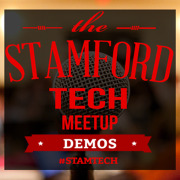 Stamford Tech Meetup provides technology companies an opportunity to demo their product to a captive audience, get real time feedback, introductions to potential employees, customers and partners in and around Fairfield County and online exposure to 1100+ technologists, investors and service providers via mailing list and blog publication. We bridge the gap and foster relationships between two great cities New York and Stamford. The Stamford Tech Meetup has had over 43 events in the past 3 years, 130+ companies demo, and 2000+ attendees and counting! Who has graced our stage? Over 130 companies have demoed at the Stamford Tech Meetup. Have you?